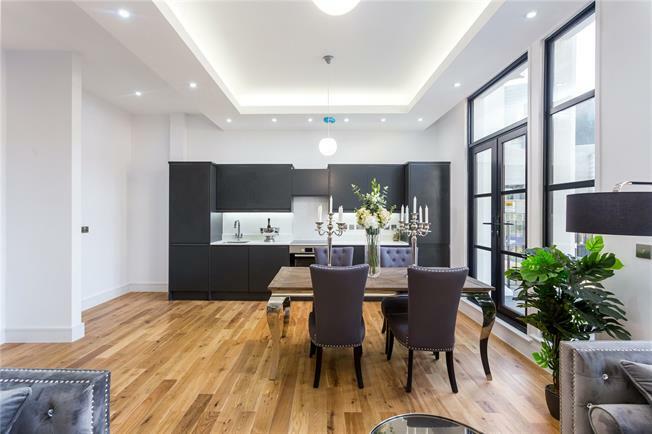 2 Bedroom Flat For Sale in London for Asking Price £600,000. An impressive 2-Bed/2-Bath apartment located on the Top Floor incorporates a large wrap around Terrace. Forming part of this striking new development in North Finchley, the flat boasts 1,026sq.ft large open-plan Kitchen/Living area, two spacious Bedrooms, flooring throughout. A new development of 21 apartments comprising of Studio, 1 and 2-Bedrooms conveniently situated for North Finchley with its range of shops and eateries with excellent links to central London via a number of Northern Line train stations which are situated within the area. The development is ideal for First Time Buyers and young professionals. colour with flush unit doors and drawers, fitted with soft close mechanism. White stone Carrara-style worktop and splash back. Stylish stainless steel sink with chrome mixer tap. Bosch integrated oven, hob, extractor hood, fridge freezer, washing machine and dishwasher. Bathrooms/Ensuites with fully tiled floor and walls, contrasting black and white tiles combined with white marble effect tiles. Black wall hung vanity units with mounted sink and taps. Selected bathrooms with concealed cisterns and wall hung WC with dual flush. Modern chrome shower head and taps. Shower screen. Large LED-lit wall mirror. Heated chrome towel rail. - Downlighters in Bathrooms, Kitchen and Living area. Recessed ‘puck’ lighting in the Kitchen/Reception rooms. LED strip lights in the Kitchen and Bathrooms. Atom pendant lights – white shade/satin silver and wall lights in Bedrooms. with off white (shade 1 diamond matt paint). Door frames matching design to the skirting. - Flooring: Kitchen/Living area – Oak engineered wood flooring, Bedrooms have carpets from the Kingsmead collection Berber Season in ‘ault biscuit’ colour. - Security include mains operated smoke and heat detectors to each apartment. Video entry system to each apartment. Lockable post boxes in main lobby area (this may change to be located externally). To arrange a viewing or for further information, please contact Preston Bennett New Homes on 0208 954 8626. The pictures you see may not be indicative of this property. They could be CGI's or pictures of the Development Show Apartment or Show Home or alternatively a previous development by the same Developer.